Fisht Stadium was completed in 2013, just in time for the Sochi Olympic Games in 2014. As the ﬂagship venue for the games, where the opening and closing ceremonies took place, it had to look spectacular. The world’s eyes were all on Sochi and Russia was eager to improve its image abroad and sell itself as a place to do business. To accomplish this, the Russians spent lavishly. Unfortunately for them, the severe cost overruns received more attention than the venues themselves. At an estimated $51 billion, the 2014 Olympics remain the most expensive ever. More recently, the doping scandal that came to light after the Games promises to cast a shadow over this year’s World Cup, especially in Sochi. Since the Games, the arena has had a hard time attracting more than a few thousand fans to any one event — not surprising given the city has a population of just 350,000. Sochi had a professional, third-tier football team for just one season, in 2014-15, after which the team failed to qualify for subsequent seasons. They are now taking a break, though the mayor (who sees no obstacles preventing FC Sochi from reaching the top tier) has announced that once the FIFA tournament is over he plans to transfer the stadium to them, albeit with reduced seating. Despite the problems and cost overruns surrounding the arena’s construction, Fisht did not fail to impress international audiences when they arrived at the Olympic Park. The 47,659-seat stadium is named after Mount Fisht, whose twin peaks (as seen from some of the Olympic facilities) bear a resemblance to the split white roof of the structure. At night, the stadium can be illuminated from the inside in a multicolored display, which plays nicely with the singing fountain in front, where the Olympic ﬂame burned during the Games. 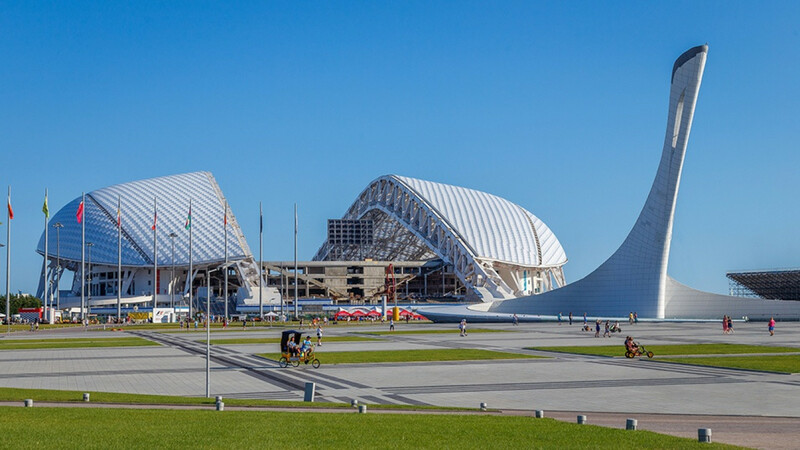 The stadium stands at the center of the Olympic Park in Adler, 30 kilometers from the center of Sochi, on prime oceanfront property. Indeed, right behind the stadium is one of the Black Sea’s famously pebbled beaches, so bring your swimsuit on game day. The park also has a number of other interesting sights. There are several museums, including one palm-tree ﬂanked building housing a trifecta of museums dedicated to Leonardo da Vinci, Nikola Tesla and the Soviet Union. Standing separately is an automotive museum, which houses both sports cars and Soviet classics. 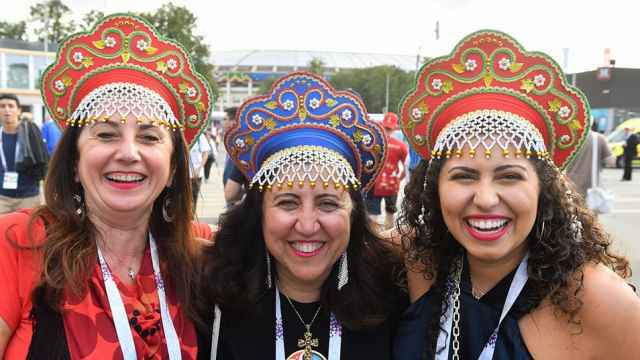 It may also be worth your while to visit the amusement park and get a great view of the stadium, the Black Sea, and the Caucasus all at once from the Ferris wheel. The easiest way to get to Fisht Stadium is the commuter train. From Sochi Station to the Olympic Park takes 50 minutes; from Adler Station it takes just 13 minutes. Once you arrive, plan on walking for another 20 minutes to get to the stadium. The Mir payment system reportedly jumped the gun to congratulate Russia for winning against Croatia. China is second place behind Russia in the number of football fans attending matches, and many of those fans are also shelling out. Russia's stinging defeat leads to much-needed reflection.